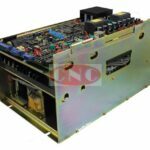 Fanuc AC Spindle Servo Unit. Series 6044, 6052 small, 6055, 6059 S / P, 6060 I, 6062 / 6063 / 6064 Serial. At CNC we offer an large inventory of most AC spindle drives from the above series. Contact us either for exchange, repair or fault testing services.